We don’t just stock trampolines for the backyard – we also make high quality trampolines for the competitive trampoliner. 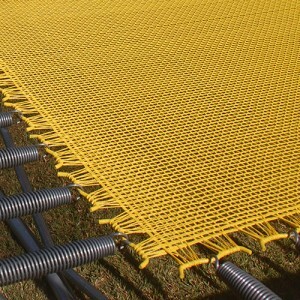 Our yellow 2-string mats are super bouncy – they have less resistance when moving through the air. However, maintenance of these trampolines is slightly more involved. Paint the underside of the mat about once ever two years. 2-string mats are an investment, but with the proper care they can last up to a huge 20 years.